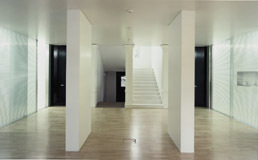 The task facing the architects was to convert a 19th century townhouse designed by architect Weinbrenner into contemporary office accommodation for a legal practice. The configuration of the interior was altered while the facades, the veranda (added in the early 20th century) and the original, still-sound loadbearing structure were retained. Viewed from the exterior, the building stands out from its context in character and massing. From being the seat of a well-to-do 19th century family, it might now be described as a "monumental private property serving a mundane purpose". The interior underwent a full-scale transformation. The spaces are open and modern, and every last corner receives ample daylight. Clear glass, as the dominant material, creates a transparent office atmosphere catering for present-day needs.